We had intended setting off for Dingle early in the morning but we fell by the wayside. We had stayed at a house up at Caragh Lake, demurely had dinner beside an American couple without exchanging a word, walked around the house and came back in to the drawingroom to sit quietly in a bay window. Suddenly the door opened and a bright smiling blonde girl came in sat down and introduced herself as Marian. She and her husband, Nigel, were on their first trip to Ireland as their son was on a school rugby trip in Limerick. As often happens with English people who have no family connections with Ireland, it was their first trip here, and frankly they wouldn’t have come unless they had to, for they usually went to exotic locations. We had a drink, and another drink before Nigel sensibly suggested they retire. Next morning at breakfast we all waved at one another, had little polite chats, and nodded to the Americans. We got our bags out to the car where the American couple were trying to map out their route. Telling us they had Restaurants in the States, I confessed to being probably their archenemy – a Restaurant Critic. With that a German car swung into the car park and came over to join in. On learning my occupation the German went to his car boot and took out a little fold up table, spread a check cloth, took out two bottles of wine from his region in Germany, some titbits, special knives and told us he had been coming to Ireland for over 30 years, using the same table, knives and equipment each year! Nigel and Marian emerged and we had the League of Nations Irish, English, Americans and Germans, having a party in a Car park in Kerry, They had never experienced anything like it and told us since it was the best trip of their lives. That’s what Kerry and Ireland is really all about. 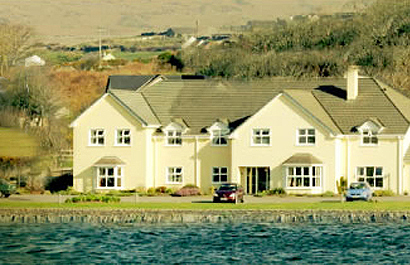 Cameron and Nuala Heaton’s eponymous Guesthouse is spectacularly located on the edge of the water with magnificent views of Dingle Bay. There is something special about being close to the water that is infectious and life giving. The shimmering ripples are wonderful to sit by during the summer and stunningly dramatic viewed through a window in the depths of winter. Heaton’s has 16 rooms, standard, deluxe and Junior Suites, take your choice, but all are beautifully draped and furnished in cool clear, up to the minute, stylish colours. Each with T.V. Tea/Coffee makers, and superb bathrooms with power-showers, are spacious and have everything you could possibly want for your comfort. There is a large foyer and a lounge sittingroom area with big comfortable sofas where you can snuggle up, cosy up, or just relax. Breakfast is served in the diningroom which also makes the most of the magnificent views with big plate glass windows. This is daughter, Jackie’s, area and you can chose from an amazing selection which includes juices, fruits, cereals, stewed fruits – rhubarb or apple- porridge with a dram of Drambuie, brown sugar and cream, followed by the traditional Irish, or Catch of the day, local Smoked Salmon and scrambled egg. Preserves and breads are home-made. Children over 8 welcome. Cameron and Nuala are delightful people, as is their daughter Jackie, and superb hospitality is their middle name.